Tired of the usual fried chicken served with gravy or ketchup? 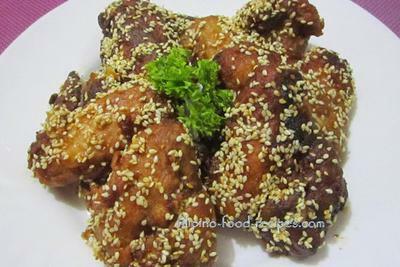 Here is the alternative the kids will surely love : Honey Sesame Chicken. It is sweet, sticky, salty, crispy with a hint of ginger. The toasted sesame seeds adds extra crunch and gives it a nutty taste. 1. Mix together the honey, tomato sauce, soy sauce, ginger. Scoop out 5 tablespoon of the mixture and set aside. 2. Marinate the chicken with the rest of the mixture for 2 - 4 hours. 3. In a bowl, combine flour, salt, pepper, garlic powder, and onion powder. 4. Dredge the chicken in flour and deep fry until golden brown. 5. In a separate pan, dissolve the butter, then add the 5 tablespoons marinade (from step 1). 6. Pour in chicken and toss for the sauce to stick to the meat. 7. Sprinkle some toasted sesame seeds. 8. 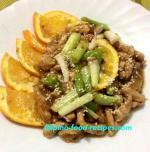 Serve as appetizer or as a meal with rice.